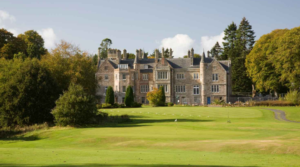 Ayr Belleisle Golf Course – opened in 1927 this classic parkland course works its way through the beautiful Belleisle Estate and was designed by the famous golf architect James Braid. The course is in a beautiful setting and is played through mature trees, with wide sweeping fairways and different elevations – making this a very different test of golf to the many links courses nearby. At 6491 yards and a par 71 it’s not the longest course but with springy welcoming turf it will play all that distance. As a local authority owned (not privately owned) course it is kept in very good condition with a newly built Clubhouse with Cafe Bar, Visitor Changing, Practice Facility, Short Game Area, Putting Green, Golf Simulator, Equipment Hire, Buggy Hire and a well stocked Pro Shop with PGA Professional in residence. The 3rd Hole – Bunker Hill – 176 yards – this is played from a tee which is positioned well below the green – so the tee shot has to be accurate and struck well to clear the many bunkers that guard the front and sides of the green. It always plays at least 1 club longer – and you will be delighted to come off with a 3 on this hole. While Ayr Belleisle may not be top of your courses to play it is a great test of golf, well worth a visit and very reasonable priced to play. Prestwick St Nicholas Golf Club – is the 26th oldest golf club in the world – co-founded in 1877 by Old Tom Morris – winner of 4 Open Championship titles. 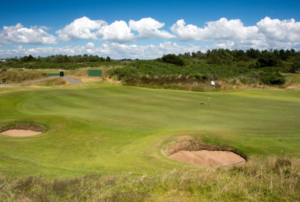 The course is a traditional Scottish links, possessing as it does a sandy, free draining soil, gorse, deep bunkers and a seemingly ever present wind which tests the skills of players of all abilities. The sandy soil allows golf to be played here all year round as the heaviest rain drains away very quickly. The course measuring just over 6000 yards (and having a par of 69 from the white tees) may be short by modern standards but don’t be fooled – the first 3 and last 3 holes are amongst the most testing of the course – with some undulations, gorse to carry and difficult greens to approach. 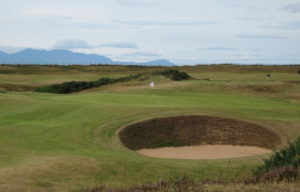 The course (with sea views from every hole) meanders in classic links style down the coast towards Ayr for the first 12 holes – before turning back to home and provides amazing views of the Firth of Clyde Coast to the Island of Arran and Ailsa Craig in the distance. A mix of classic links holes will keep you on your toes and keeping the ball in play will reward you. After the par 3 12th hole you turn for home towards the clubhouse and ensure you prepare for the last 3 holes which can test any level of golfer. 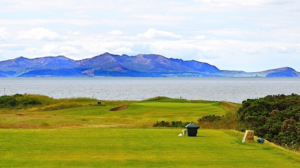 The 3rd hole – Maryborough – 281 yards from an elevated tee to an elevated green surrounded by punishing rough – a real risk and reward hole with the stunning Island of Arran in the background. It is straight as you see it. Make sure your approach shot is accurate and good for distance or the ball may end up back at your feet. The 16th – Tom Morris (the signature hole of the course) – 371 yards is a testing Par 4 with a lot of run-offs on the fairway. 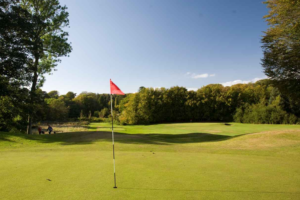 The 18th – Home – is a tough finishing hole – a 227 yard Par 3 – the tee shot is daunting – anything too far right will result in the golf ball hitting the Clubhouse or bounding down the car park Out of Bounds A Par to finish on this hole is a great score. 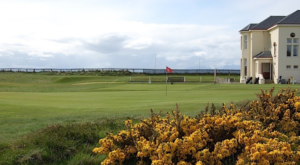 Prestwick St Nicholas is always in excellent condition – a joy to play – doesn’t need to be long to test your skills and with the excellent clubhouse facilities available (with stunning views right on the seafront) and lovely attentive staff – you won’t fail to enjoy your visit to the club. Within striking distance of Royal Troon, Prestwick and Turnberry, the course is an Open Championship Final Qualifying venue with a well-deserved reputation for some of the best maintained greens in Scotland. 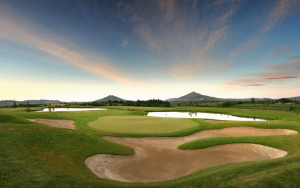 The Club has twenty seven holes with which to test the golfer, complemented by first-rate facilities in the clubhouse and professional’s shop. 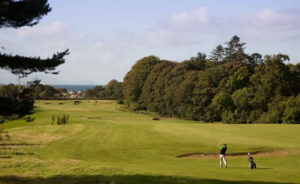 Kilmarnock (Barassie) Golf Club offers everything golfers would expect from a Scottish seaside golf course; challenging fairways and greens as well as a friendly, welcoming membership. The 4th hole – Arran – A 159 yard par 3. A walk through the pines opens up into the new nine holes and provides a glimpse of what’s to come and also brings the first par three of the day. The fourth is challenging; no room to the left due to the burn and a sleeper edged green. Only one greenside bunker and small hillocks to the right and rear make hitting the green a little more difficult. Depending on wind direction the club choice can be from a seven to a three iron and once on the green the difference in breaks becomes noticeable. An excellent par three with ample opportunity for disaster……. My next favourite hole is the 11th – Brodick – a par 4 of 439 yards – An extremely tough driving hole. Heavy rough left and new wonderfully placed bunkers pushes the golfer to the right; too far right and the approach to the green becomes difficult. This is the third dog leg left in a row and without doubt is the toughest of them all. Once you have negotiated the tough drive, the second shot has heavy rough to the left and bushes around the green to the right and rear. It is extremely easy to find trouble off the second shot and on reaching the green the trouble hasn’t let up. There are uniquely for the course no greenside bunkers but to the front Barassie’s own small valley of sin causes problems for the approach and a club too much could be enough to put the unwary golfer in the bushes to the back of the green. 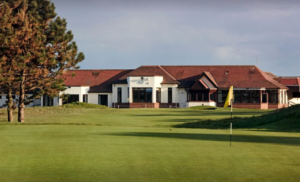 Barassie Golf Club is not as well known as some other local courses but is a gem that should be on your ‘must play list’…..
Irvine Golf Club – sometimes referred to as ‘Irvine Bogside’ owes much or its character and variety to the legendary course designer James Braid. 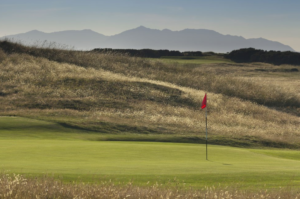 It is highly regarded by the R&A being used as a final qualifying course for the Open Championship, when it is hosted by near neighbours, Royal Troon or Trump Turnberry. Founded in 1887 Irvine is a course that often goes under the radar when people discuss golf in this part of the country but it can rightly claim to be one of Scotland’s hidden gems. 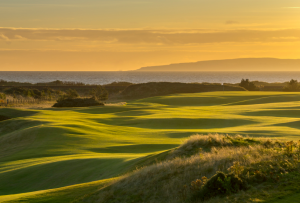 The Irvine Golf Club is a traditional links course, where greens run true and golfing challenges can be found at every hole with breathtaking landscapes and views over the Firth of Clyde to the Island of Arran. The Braid design uses the natural contours to best effect and no two holes are alike. No matter how many times you return to play this fabulous course, you will enjoy the experience as if for the first time, as you discover more of its interesting features and character. It is part of the James Braid West Coast trail and represents a fine example of his course architecture, blended with the breath taking landscapes and views over the Firth of Clyde. There are several holes that call for thought and accuracy and none more so than the 4th hole – The Moor which is a par 4 requiring accuracy from both tee and second shot. The main West Coast railway line is out of bounds on the left, running the full length of the hole. A good tee shot will set up a short iron approach to the plateau green, and although the hole is devoid of bunkers, danger awaits the overhit approach, with the River Irvine and the railway line lying behind the green, whilst an approach hit short will leave a difficult recovery chip up to the green. On the back 9 my favourite hole is the 14th – The Specs – a shortish par 4 where you need to avoid the bunkers on both sides of the fairway from the tee to set up a mid to short iron approach shot to the green which lies over a grass bank containing the 2 bunkers from which the hole takes its name. The green is two-tiered, making the accuracy of the approach important if a three putt is to be avoided. There are many fine links golf courses on the Ayrshire Coast. The Irvine Golf Club should stand proudly as one of the best but maybe less familiar – and should be on your ‘must play’ list. A club where you’re always guaranteed a very warm welcome and fantastic turf from which to play. 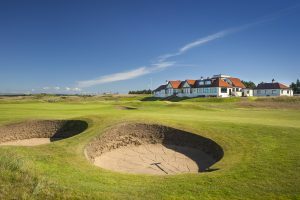 Gailes Links (sometimes known as Glasgow Golf Club) has hosted major championship tournaments through the years and was designed by legendary golf architect Willie Park Jnr of Musselburgh. It was opened in 1892 by Glasgow Golf Club, the 9th oldest golf club in the world, whose members initially played on Glasgow Green and subsequently on Queen’s Park and Alexandra Park, all 3 areas which were owned and managed by the then Glasgow Corporation and were open to all Glasgow citizens whether or not they were club members. As golf mushroomed in popularity at the start of the 1890s and the Alexandra Park course became more and more crowded, the members decided to start looking for suitable ground in Ayrshire to establish a course which would complement the city one and, most importantly, which they themselves would control and manage – and soon homed in on Gailes and agreed the initial lease with the landowner, the Duke of Portland, in time for the course to be officially opened on 19th May 1892. Its West Coast setting and fabulous condition makes it ideal for summer and winter golf in Scotland. Gailes has been an Open Championship Final Qualifying course since 1973 and it has also hosted The Home Internationals, the Europe v USA Palmer Trophy, the Scottish PGA Championship, the Scottish Amateur Championship, the Scottish Open Amateur Strokeplay Championship, the Scottish Seniors Open Amateur Strokeplay Championship, the British Youths Open Amateur Championship and the British Seniors Open Amateur Championship. For four years from 2014, Gailes Links will be the sole Scottish Final Open Qualifying course. At 6903 yards long from the championship tees with a par of 71 Gailes Links Ayrshire is a great test of golf whilst the kinder medium tees provides a fine test for players of all abilities. It is simply traditional links at its best. The challenge starts with a steady stream of four consecutive par fours followed by the signature hole of the course, the 5th – a par five of 536 yards – a dog-leg with out-of-bounds to the right and a treacherous undulating green that’s guarded by strategically placed sand traps. Playing downwind the longer hitters may have a chance of hitting the green in 2 – other players should try and lay up to 100 yards out to give themselves a chance to make a birdie with an approach shot to the right side of the green leaving you with a makeable uphill putt. On the back 9 my favourite hole is the 15th – a par 3 where although its only 140 yards to the front of the green it’s no pushover. Your tee shot must be accurate or a bogey or worse is on the cards. A narrow green is guarded by 2 deep pot bunkers on the right and a 10 foot drop on the left. The best play on this hole is a short to mid iron to the front of the green which will leave an uphill putt and the best place to attack for a 2 putt par. With its undulating fairways, fine greens and subtle qualities, the course is an honest test of golfing skills in true links fashion and there’s always a warm welcome in the clubhouse! 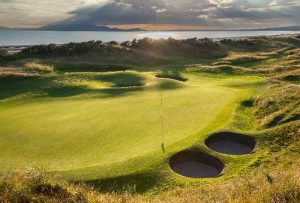 Royal Troon is one of the greatest links courses in Scotland – founded in 1878 by a few enthusiasts, Troon Golf Club soon outgrew its purely local reputation. The Old Course today represents a stern golfing examination and in particular the inward half of Royal Troon is widely accepted as the most demanding of any Course on the Championship rota. 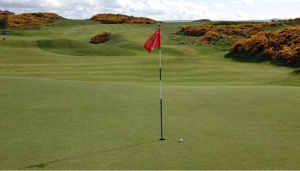 It’s a challenging test of golfing ability with the wind and deep rough to contend with – with gorse and broom on each hole – where shot making is essential. 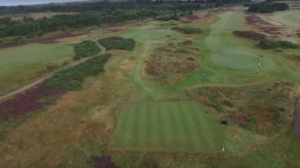 Royal Troon Golf Club proudly hosted The 145th Open Championship in July of 2016 where the modern day ‘Duel in the Sun’ took place between Stenson and Mickelson. 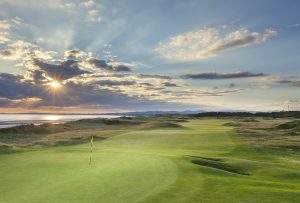 It was the ninth occasion The Open had been held at Royal Troon and considering the Club’s humble beginning in 1878, the journey has been remarkable with great credit due to some forward thinking members during the Club’s early years. The first 6 holes go straight Southwards along the seashore – normally downwind where you’re generally able to fashion a score. The back 9 is is a great challenge – generally back into the breeze with the last 2 being tough finishing holes. The 17th – Rabbit (at 218 yards off the back tees) is the last and most difficult of the short holes where the tee-shot can be as much as a driver, depending upon the wind. The plateau green falls away sharply on both sides and is well guarded by bunkers, short and on the right and left hand sides. A challenging hole if you have pencil and card in your hand. The 18th – Craigend (at 464 yards off the back tees) requires an ideal drive straight down the centre to avoid the bunkers on either side of the fairway. Bunkers short of the green will catch a mishit second shot and the green itself, which lies right in front of the clubhouse, is protected by a bunker to the left and two more to the right. An overhit approach shot could finish on the path at the rear of the green, which is out of bounds. The history of Prestwick Golf Club (sometimes referred to as ‘Old Prestwick’) stretches back over 160 years to a time when golf was in its infancy. In 1851, a group of 57 enthusiastic members, who met regularly at the Red Lion Inn, made the momentous decision to form a golf club purchasing two cottages opposite the tavern. The first cottage would become the members’ clubhouse whilst the other was gifted to the club’s Keeper of the Green, ball and clubmaker – Old Tom Morris. Together with a gold medal presented by the club’s first captain (the Earl of Eglinton) for an annual competition still played for today, the legend of Prestwick was born. The birthplace of the Open Championship is what this amazing golf course boasts and a simple stone cairn to the west of Prestwick’s clubhouse marks the spot where the first Open Championship tee shot was struck in 1860. It identifies the opening hole of the original 12-hole course and the place where modern golfing history began. Prestwick presided over the first 12 Open Championships, which was then held jointly with The Royal and Ancient Golf Club of St Andrews and The Honourable Company of Edinburgh Golfers. Prestwick went on to host 24 Open Championships with the last being held in 1925 when Jim Barnes from the US secured the first prize of £75. 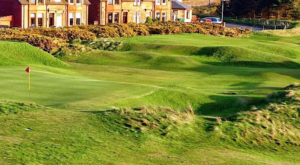 Only the Old Course at St Andrews has hosted more Open Championships than Prestwick…..
Below are some of what I consider the feature holes of an amazing test of golf. The 1st hole – Railway – Par 4 – is one of the most famous opening holes in golf and sets the tone for the course, with an out-of-bounds wall running down the right-hand side from tee to green. You need to hit 160 yards to reach the fairway. Around 200 yards will leave a short iron to the green, favour the right side of the fairway for an easier second shot. The 5th hole – Himalayas – Par 3 – this is a world famous blind par three. It is crucial to aim at the disc on the hill that matches the tee you are playing from, and make sure you take enough club to match the distance. It is a testing shot especially as the prevailing winds will push you towards five bunkers on the left side of the green. The green slopes back to front, so leaving it short will give you an uphill putt. My favourite hole – the 17th – Alps – Par 4 – is a real treat – it’s the original 2nd hole from 1851 and the oldest existing hole in championship golf. The narrow fairway requires an accurate tee shot to allow the best chance of reaching the green in two. The blind second shot plays every inch of the yardage. Falling short will mean playing from the famous Sahara bunker. Check the tee box as this will indicate pin positions that you can then correspond to the markers on top of the Alps. It’s a fantastic experience to play golf at the birthplace of the Open Championship and you shouldn’t leave without taking in all of the historical memorabilia housed within the stunning clubhouse. Another one of my favourites in Ayrshire is Dundonald Links which is located near Irvine and was originally known as Southern Gailes. This Kyle Philip’s-designed golf course was purchased by Loch Lomond Golf Club in early 2003 to provide its global Membership with a traditional links challenge. 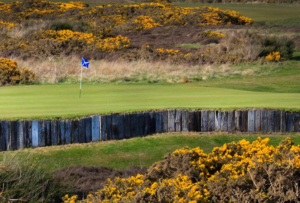 The courses name was changed to Dundonald Links to reflect the area’s rich history as Dundonald means ‘Fort Donald’ and fortifications have been discovered nearby dated to between 500 and 200 BC. As early as 2008 Dundonald Links was chosen as the venue for the first stage of the European Tour Qualifying School and it continued to host this important tournament until 2011. In 2012, it was the turn of the Seniors to test their skills against Dundonald’s challenges when the course played host to Senior Opening Qualifying. 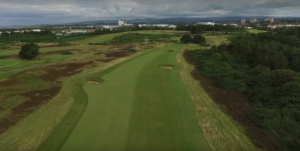 The prestigious Boys Amateur Championship came to Dundonald in 2014, before the course welcomed some of the world’s best female golfers for the Aberdeen Asset Management Ladies Scottish Open in 2015 and 2016.I t’s a great test of golf with the wind playing a big part in the difficulty factor. It hosted the 2017 Scottish Open and Ladies Scottish Open with broadcasting worldwide. Although the current clubhouse isn’t stunning to look at (it’s a temporary facility) the welcome you receive and the facilities within more than make up for that. The course meanwhile challenges all aspects of your game and several subtle changes which have been made in the past 2 seasons to some of the greens have made it more playable and my opinion enjoyable. There are a couple of holes on the course that really stand out for me – the first is the 6th hole – at 170 yards and a Par 3 it’s very tricky with numerous obstacles surrounding the green and a prevailing right to left wind that can be difficult to detect from the sheltered tee. Tee shots should be played to land on the right half of the green, avoiding the cavernous ditch gathering any shot hit left and taking advantage of the contours to bounce towards the centre of the green. It’s a great test for your short game! The other hole that stands out from my perspective is the 18th hole – it’s the longest hole on the course and almost always a three shot hole. Playing down the left side of the fairway from the tee will avoid the two bunkers on the right. An accurate second will ensure you miss the cross bunkers waiting to catch any wayward shots and will set up an approach to a green guarded at the front by an imposing ditch and to the rear by pot bunkers. Don’t get greedy here, it just might spoil your card! 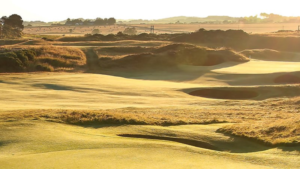 Western Gailes Golf Club is a true links course where elements of nature, architecture and tradition come together to provide an amazing test of golf! There is a traditional clubhouse with views out across the Firth of Clyde to the hills of Arran and the sharp outline of Ailsa Craig which has all the facilities you could possibly need and where you’ll receive a warm welcome. The course itself provides a classic test of golf over undulating terrain with develish bukering, meandering burns and finely contoured greens all framed by natural sand dunes and t’s probably not until you play the last 3 holes that you truly know you have played a real classic – with you having to concentrate right up to the end of your round. It’s reputation as one of the game’s ﬁnest and more exacting courses has spread worldwide as evidenced by its numerous visitors from around the world including golﬁng legends from this and the last century. The great Harry Vardon arrived at Western Gailes in June 1903 celebrating his fourth Open victory. In 1923 its attractions were being lauded by the then US Open Champion Gene Sarazen who played the course with three other outstanding professionals. Greats from the second half of the 20th century such as Gary Player, Tom Watson and Tony Jacklin have also visited, while from the modern game Luke Donald, Rory McIlroy and Bubba Watson have all tested their mettle over this classic links course. For the majority of golfers at approx. 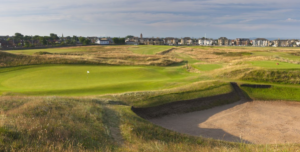 6500 yards off the yellow tees (and just over 7000 yards from the back tees) Western Gailes should be a good test of golf and a very enjoyable experience – and I always relish playing it. 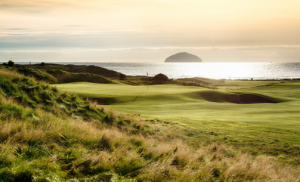 Set alongside the glorious Ayrshire coastline, with Arran and Ailsa Craig as a stunning backdrop, the Ailsa course is one of the finest golfing destinations in the world – is in my Top 3 courses of all time and is always a special treat to play. It has had the privilege of hosting the Open Championship four times, including the unforgettable 1977 Duel in the Sun – between Tom Watson and Jack Nicklaus won in the end by Tom. It’s serviced by a ‘grand’ clubhouse (where every facility is available) a very well stocked Pro Shop and a Golf Range with putting green. From the minute you approach the first tee where the starter is waiting for you with a little tartan bag of goodies to the moment you come off the 18th green playing the Ailsa Course is a wonderful experience. The Testing 9th hole from the back tee! It has several testing holes none more so than the 9th hole which is a spectacular par 3 playing across the bay to the iconic Lighthouse. It measures 243 yards from the back tee and is a really testing shot (especially when the wind comes into play). The Ailsa is a classic links course (with heather, gorse, deep bunkers and running fairways) and was remodelled again in 2016 by reknowned architect Martin Eber – whose changes have enhanced an already great layout. This is a ‘must play’ for golf enthusiasts and I hope will be back on the Open Championship circuit very soon allowing us to see exceptional golf in an amazing setting – and future ‘duels in the sun’.